PORTLAND — It was game of big, big plays. It was a game of offensive fireworks. There were many, many huge shots. 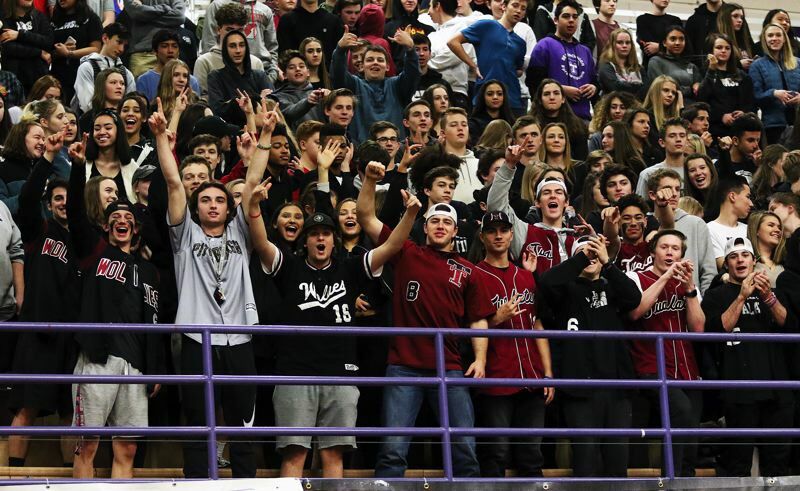 And, unfortunately for the Tualatin High School boys basketball game, Barlow had the last huge shot. 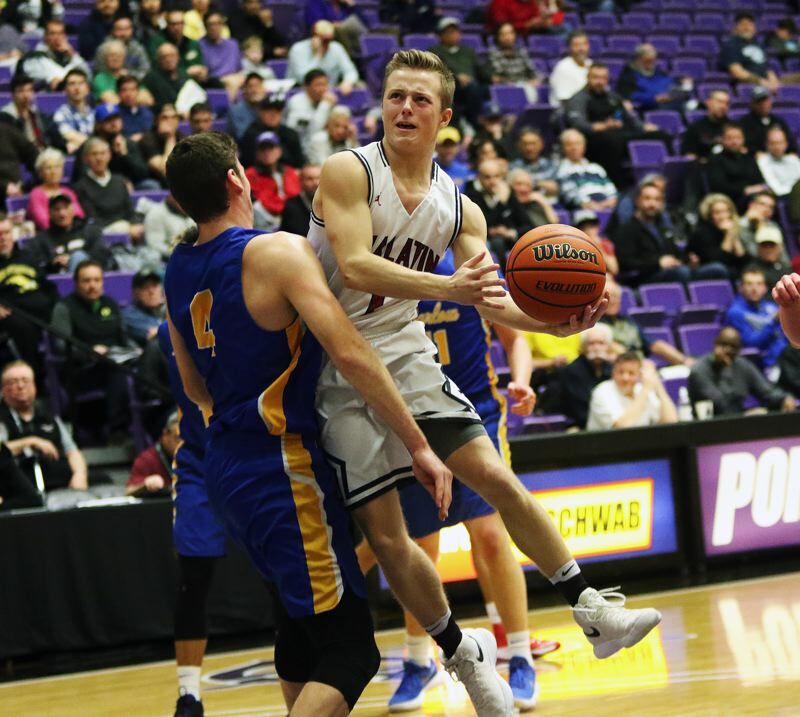 The Bruins, with sophomore guard Jesse White sinking a 25-foot 3-pointer with 1.3 seconds remaining in the contest, came away with a 69-66 win over the Timberwolves in a Class 6A state tournament quarterfinal thriller played Thursday at the University of Portland's Chiles Center. 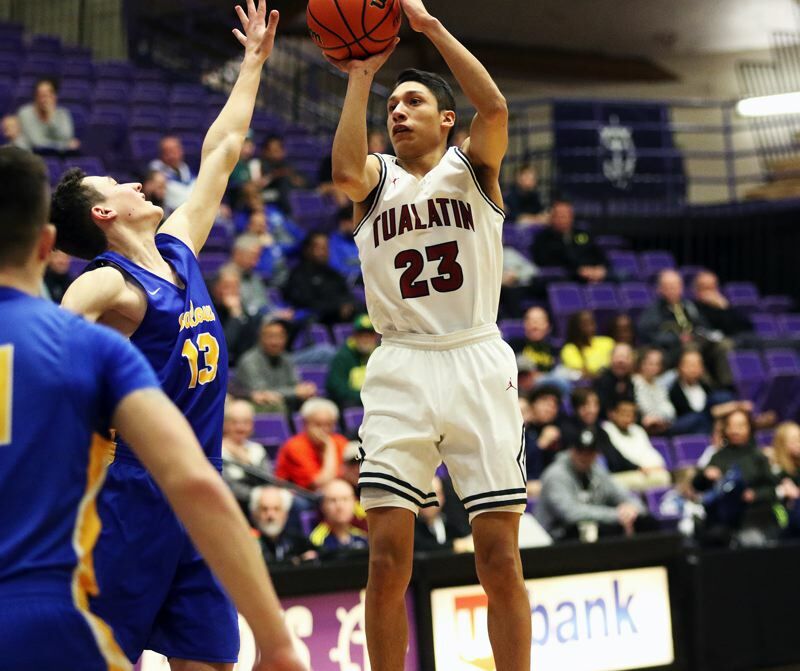 "It just came down to who had the last possession," said Tualatin senior wing Alexis Angeles, who led all scorers in the contest with 36 points. "Both teams did great things on both ends. We couldn't have played better defense throughout the game. They made tough shots. It's just one of those games. Everyone was hitting. It's one of those tough games, where somebody has to lose, and unfortunately, it was us tonight." 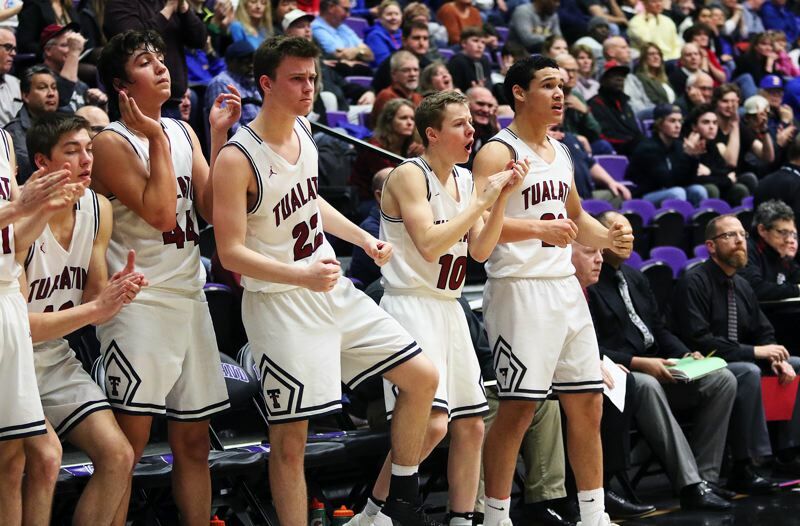 "It was amazing," said Tualatin junior wing Caden Dickson, who had a big shot of his own, sinking a game-tying 3-pointer with 43 seconds left to play in the contest. "It was very entertaining. They shot the heck out of the ball. There wasn't much we could do. They knocked down the shots, and props to them." With the win, Barlow, which shared the Mt. Hood Conference championship, and is also the No. 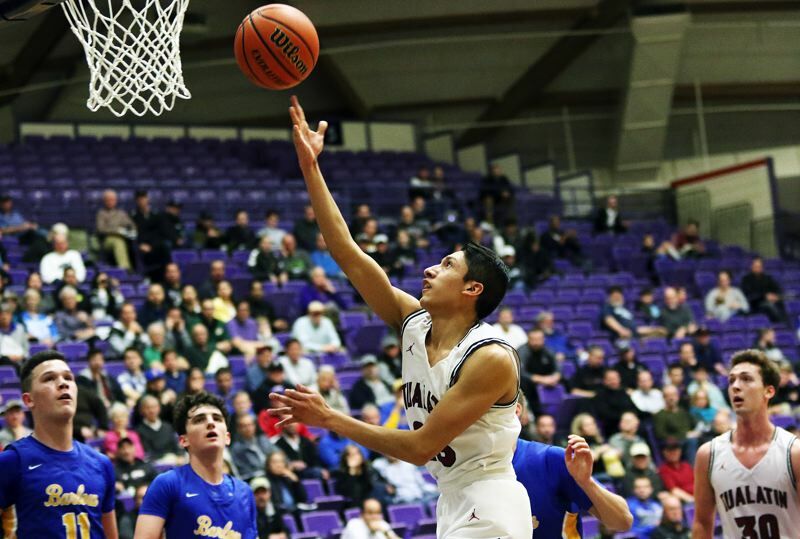 20 team in the final OSAA power rankings, improved to 19-8 on the season. The Bruins also advance to the semifinal round of the state tournament. They'll face top-seeded Jefferson in a semifinal tilt Friday, starting at 6:30 p.m., at the Chiles Center. Tualatin, the No. 4 team out of the Three Rivers League, and the No. 12 team in the power rankings, moved to 18-9 on the season. The Wolves will meet Jesuit, a 63-48 quarterfinal loser to Jefferson on Thursday, in a consolation semifinal Friday at 9 a.m. The offensive fireworks started early in Thursday's quarterfinal contest. 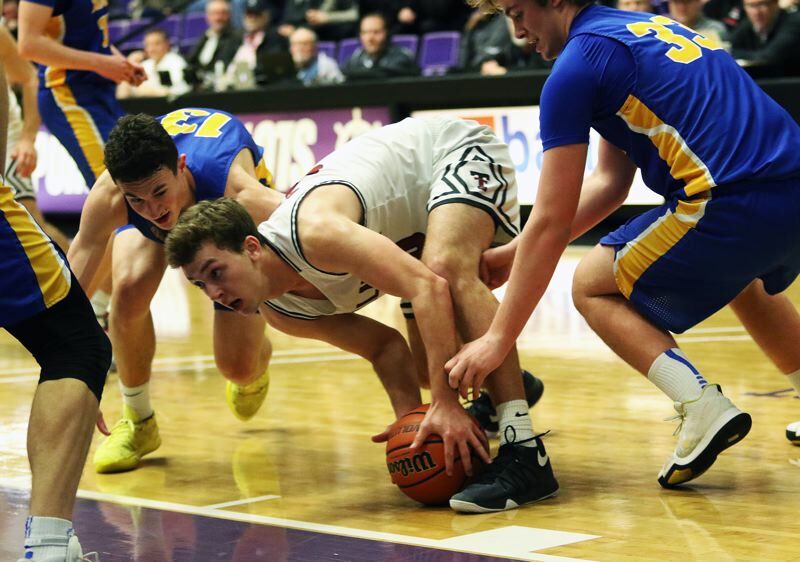 With Angeles and senior Chris Freese, who had four offensive rebounds and three follow-up baskets, leading the way, the Wolves got off to a fast start. Angeles, who tallied 12 points in the first 5 minutes and 42 seconds of the game, scored on a drive to give Tualatin a 23-15 lead with 2:18 left in the first quarter. "I had a lot of energy going into the game," Angeles said. "I just wanted to help get my team off to a good start. We feed off each other. I wanted to get off to a strong start and be aggressive." But, with White converting a four-point play, and scoring 12 points in the final 2:05 of the period, Barlow rallied to claim a 27-26 lead going into the second quarter. 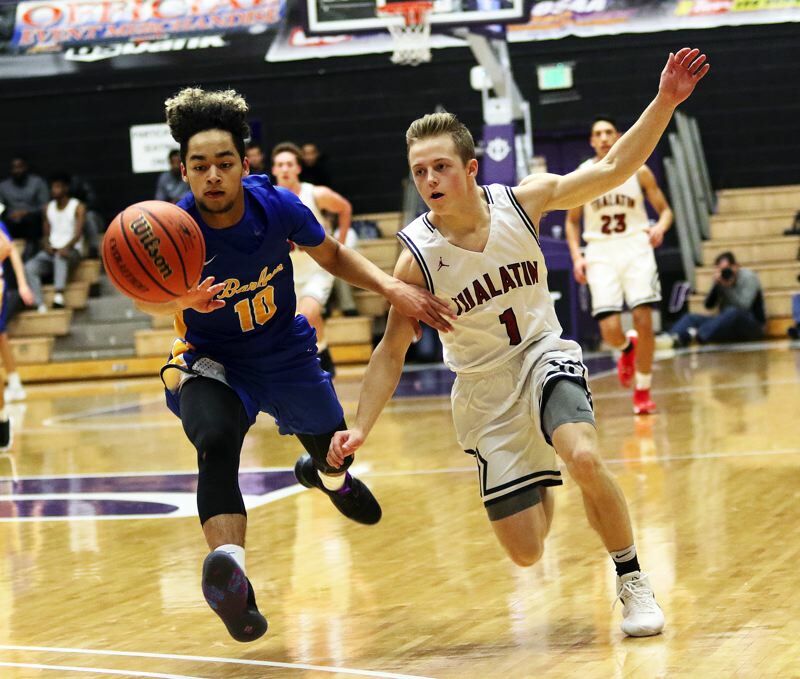 The lead changed hands six times in the second quarter, with Angeles scoring eight points in the period, with Barlow going to halftime holding a 41-40 lead. 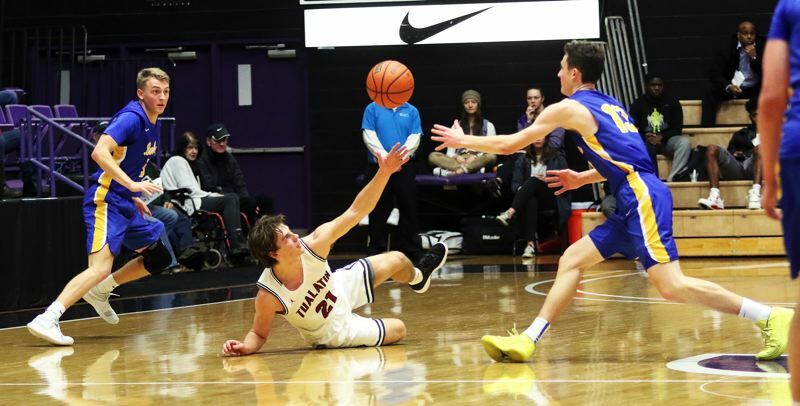 In the third quarter, the Wolves got nine more points from Angeles, as well as a 3-pointer by junior Jack Rose and a follow-up basket by junior Bridger Steppe. But Barlow countered with 14 point in the period by senior Cole Edmondson, helping the Bruins take a 60-54 lead into the fourth quarter. That's where things really got intense. Neither team was able to score in the final stanza until Angeles converted a three-point play, cutting the Barlow lead to 60-57 with 4:43 left in the game. Dickson got the Wolves even closer, at 60-59, after coming up with a steal and basket on a drive to the hoop with 4:07 remaining. The Bruins pushed the lead back to three, at 64-61, on a pair of free throws by senior Austin Forrar with 2:21 left to play. But the persistent Timberwolves came right back again. Angeles sank a 12-foot pull-up jumper to trim the margin to 64-63 with 1:15 remaining in the contest. White answered with a basket on a turnaround foul-line jumper, giving the Bruins a 66-63 lead with 57 seconds remaining. Dickson then came up with his heroics, sinking a deep 3-pointer from the right wing, tying the contest at 66-66 with 43 seconds remaining. "I ended up in an open spot, got the pass, and I was able to knock it down," Dickson said. Barlow, working for the last shot following Dickson's basket, got the ball to White as time was running out. Dribbling out on the deep right wing, White headed toward the middle, pulled up and sank his go-ahead 3-pointer. 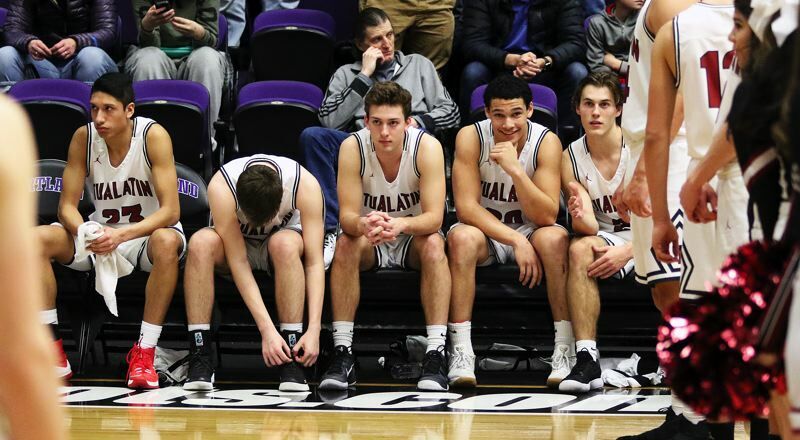 Tualatin, after getting a timeout with 1.3 seconds left, had its inbounds pass knocked out of bounds, near half court, by the Bruins with 0.5 seconds remaining. The Wolves got their next inbounds pass to junior Derek Leneve, but his desperation 3-point attempt, under heavy pressure, was short, leaving Barlow with the 69-66 win. "He hit a dagger, and props to him," Dickson said of White's game-winning basket. "It's tough to end like that." "We really did have something to prove," Angeles said, referring to both teams. "We were the highest seeds coming into the tournament, and, I think if we would have played anybody else in this tournament we probably would have beat them and got an upset right off the bat. We just happened to play each other in the first round, and we put on a show." Angeles scored his 36 points on a 16-for-29 shooting night from the field. He also had seven rebounds in the contest. Rose sank a pair of 3-pointers and scored 10 points. Dickson scored seven points. Freese had six points and six rebounds. Senior Lucas Noland had a pair of steals for the Wolves. 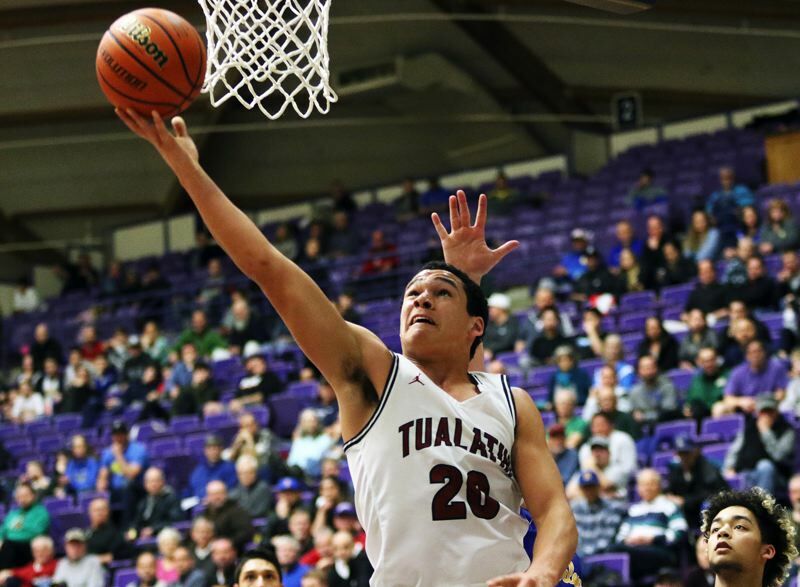 Tualatin, as a team, made 28 of 63 shots from the field, with five 3-pointers, and five of nine free-throw attempts. Barlow did most of its damage from 3-point land, shooting at a 15-for-28 clip from beyond the arc. White, making six of his 11 3-point attempts, led the Bruins with 27 points. Edmondson scored 17 points and junior Daello Portin-Chapman came off the bench to score 15 points. Barlow, as a team, made 23 of 53 total shots from the field and four of eight free-throw attempts. Jesuit brings an overall record of 21-6 into Friday morning's consolation semifinal game. "It's very important," Angeles said of that game. "We're going to learn from this and move on. It's win or go home. Hopefully come out strong tomorrow."